Do you ever feel like there is just not enough time in the day to get it all done? The housework, making more time for the children, errands, family time, shopping...how are we to fit it all in? In the rush of our day to day life, sometimes even the important things gets pushed to the side...like making time for God. I hate to admit it, but it happens to me as well. Of course I want to make the time, but as I go on and on and on I realize another day has come and gone. It's hard to make the time when there is already so much to pack into an already busy day! So, what are we to do? For this reason, I am always on the hunt for great Christian music choices...and there are certainly many out there! From country to rock to pop and of course to the classic gospel, there are options to fit whatever musical tastes you might have. Personally, I love a variety and my music collection reflects that. 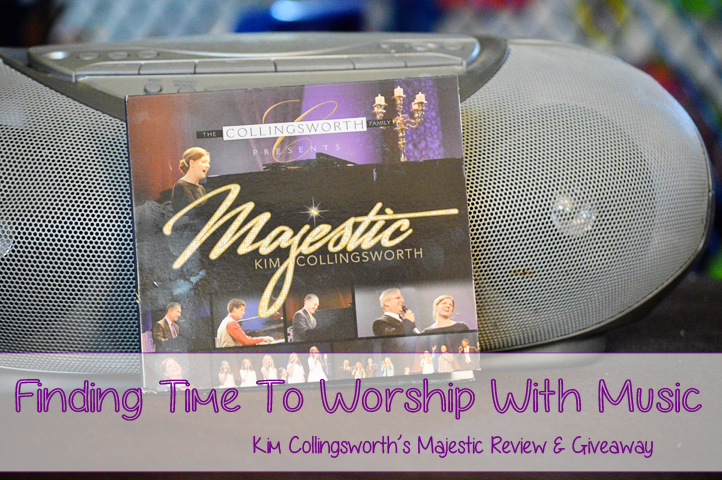 So, I was thrilled to have been given the chance as a Family Christian Stores blogger to experience a wonderful new album, Majestic by Kim Collingsworth. The choice of a live recording was an easy one for Kim Collingsworth, because she considers it such an encouraging event to share. "The audience is invigorating! I love the excitement and spontaneity that a crowd brings, and the emotion from a live audience." Long-time and new fans alike will appreciate the project's great value (more than 15 selections), and are sure to experience artistry at a new level as they enjoy the unforgettable evening captured on this new "Majestic" live CD. Now I'll be honest, 'Instrumentals' is not the first category I usually browse when looking for a new album. In fact, it's probably the last. Not that there is anything wrong with instrumentals, I just tend to find them to be not the most exciting option. This particular album makes me rethink that mindset. First and foremost, Kim is so beyond talented...the energy is evident in each and every song and you truly cannot help but enjoy it. Though it might not have been my first choice had I went to the store to choose something for myself, I was thrilled to experience the music and the compelling stories told throughout as well. As mentioned above, this was recorded from a live concert event, and as great as the CD was, I know the show itself (not to mention the DVD) must be even more impressive. You can feel the energy of the crowd, and I love hearing them sing along on various songs as well.I also love getting to know the Collingsworth Family and hearing their voices sing along as well. That's right, though this IS primarily an instrumental, there is some singing here and there...and it's beautiful! I also loved the few non-Christian songs thrown in such as 'Some Day My Prince Will Come/Once Upon A Dream'. As a huge Disney Princess fan, that was a welcome treat as well. Overall, I was really happy with the experience and look forward to hearing more from Kim Collingsworth in the future. For me personally, I have found this to be the perfect relaxation music. Sure, it's upbeat and energetic...but I'm also one who likes to sing along when the words are ther, so this just allows me to have that wind down time to reflect on Him without that temptation. I would buy Into The Light if I win! I really want to get the Willow Tree: Nativity Set !!! They have so many wonderful things there. I was there earlier today and I love their Thanksgiving angel and so much more.